I've been spending a bit of time on the awful AngloInfo forum where a lot of Brits in Normandy hang out and amongst tips for finding Guinness and real Bisto granules (same thing but dried, n'est-ce pas? Ed.) there are a few gems of local information worth hanging onto. For example, as part of a local (and for all I know EU wide) initiative to restore traditional hedging all householders in Manche are entitled to 50 hedging plants at, if I remember correctly, 20 cents each plant each year. Application forms available in the Mairie. Worth having. There is also a Tree Fair is Lisieux just up the road from us each March in which the whole town is taken over in massed horticultural frenzy. And we've been looking at ways of repairing the buildings traditionally by referring to British practices but it seems there are local enthusiasists trying to keep local skills alive. I've been given the address of Pierre et Masse, 50210 Cerisy la Salle just down the road from Ouville. The website was disappointing, seemingly an unfilled blogspot (!) but it's good to know that some people somewhere have some interest that they may be willing to share with us. Tonight's picture is from a friend of Mark Ynys Mon's who is part of the writing on the snow. 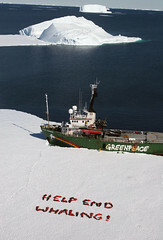 Support Greenpeace and Stop Whaling.